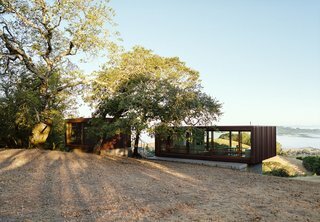 Two architects collaborate on a modular compound that celebrates an unspoiled Sonoma landscape. When an architect creates a house for another designer, expect a certain level of obsessive compulsiveness. When building a modular getaway for client BJ Siegel, architect Geoffrey Warner had to make sure that everything was just so: the floor boards are laid exactly on center with the steel columns, and the sliding doors glide on tracks flush with the ceiling. "BJ is a liner-upper," Warner says with a laugh. Siegel, a fellow architect, was an exacting client. So when BJ contemplated building a small retreat for himself, wife Danielle, and teenage son Jules, he immediately thought of going prefab. "It’s the way to get the best quality control, and the best price in the end," BJ says.